Can you predict the outcome of a boxing match based on the Body Language of the fighters? Yes. At least you can say who, going into the fight has more confidence. In tonight's Manny "Pacman" Pacquiao vs. Juan Manuel Marquez III fight in Las Vegas, Pacquiao not only demonstrates more confidence, but Marquez shows some trepidation. Both of these men are in great shape and are considered by many to be two of boxing's best - so clearly they each have talent, skill and experience. Any athlete knows though - that in close games, races, matches or fights - it comes down to who has more confidence. In the above image, while the resolution is modest, one can clearly see the suppressed yet sincere smile of Pacquiao (left). His raised cheeks and orbicularis oculi pars orbitalis muscles (which elevate the cheeks and surround and close the eyelids) each "bunch-up" the tissue of his lower lids. This is a fantastic example of someone smiling with their eyes while trying to suppress their mouth component of the smile (most people wrongfully think the mouth is the only component of a smile). Yet we still can still see the corners of his mouth elevated. Marquez (right) is clearly frowning. He's not trying to look mean or menacing here - he's frowning. Frowning is anything but a beacon of confidence. Another difficult thing to see in this photo (but it can be seen in videos of this weigh-in) is Marquez's tendency to chew on the inside of his mouth. In the Body Language lexicon, this is known as "false mastication" and in this context, it is a classic nonverbal sign of fear-anxiety. In other settings it may indicate lying-anxiety (See Negotiation Secret # 33: False Mastication for a better photographic example). Another signal in the image above, is very subtle. It's a trace of fear in Marquez's eyes. Can you see it? In the photo below, I want to call your attention to each man's shoulders. Pacquiao's are positioned more posterior (towards his back) giving him a much more "squared-off" appearance. Marquez's shoulders are considerably more forward - giving his shoulders a rounded silhouette. This is a strong signal of high confidence (Pacquiao) vs. low confidence (Marquez). Head position is also very important, however Marquez's slight chin-forward, nose up pose is so cliche' in boxing weigh-ins, as to be a caricature - so in this particular moment, it has little meaning. 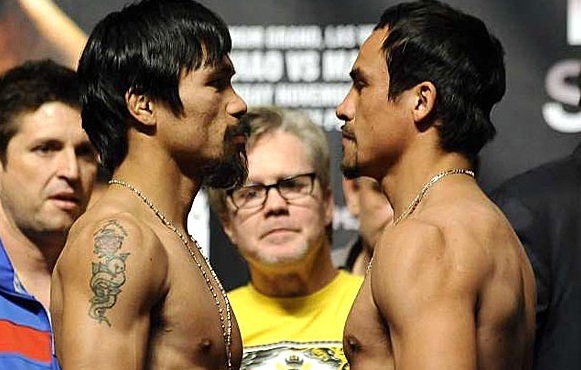 Based on each boxer's confidence at the time of this weigh-in, Manny "Pacman" Pacquiao will defeat Juan Manuel Marquez. You heard it here first. How much are you wagering on Manny?